The Great Spotted Woodpecker (Dendrocopos major) is distributed throughout Europe and northern Asia. It is mostly resident except in the colder regions of its range. It lives in woodlands and parks with old trees for nesting and plenty of food. Great Spotted Woodpecker averages 23-26 cm in length, with a 38-44 cm wingspan. The male's upper plumage is glossy black, with a crimson spot on the nape (back of the neck) and white on the sides of the face and neck. There is a large white patch on the shoulder. The fight feathers are barred with black and white. The three outer tail feathers are barred; these show when the tail is outspread, acting as a support in climbing. The under plumage are buffish white, the abdomen and under tail coverts (feathers) red. The bill is slate black and the legs greenish grey. The female has no red patch on the nape (back of the neck). This spot is also absent in the juveniles, but the crown (top of the head) is crimson. 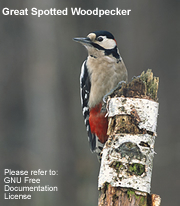 Similar Species: It looks similar to the smaller Lesser Spotted Woodpecker except for the red on the abdomen. When hidden by the foliage, their mechanical drumming can often be heard, which is a vibrating rattle, produced by the rapidly repeated blows of strong bill upon a trunk or branch. This is audible from a great distance. The call is a sharp quet, quet. They feed on those insects which bore into or otherwise damage the timber of forest trees such as the larvae of wood boring moths and beetles. Beechmast, acorns, nuts and berries are eaten when insect food is scarce. Their round nesting hole is bored in soft or decaying wood horizontally for a few inches, then perpendicularly down. The nest is situated at the bottom of the shaft in a small chamber. The average clutch size consists of five to seven creamy-white eggs.